I recently did a kind of colourful hairstyle recently which I still stand on the fact that all colours used are actual, possible hair colours. I had platinum, yeah, whitish hair, brown and of course my hair is natural black with some whitish grey highlights for wisdom. I loved my hairstyle to pieces and it kept me smiling most of the times. Why? 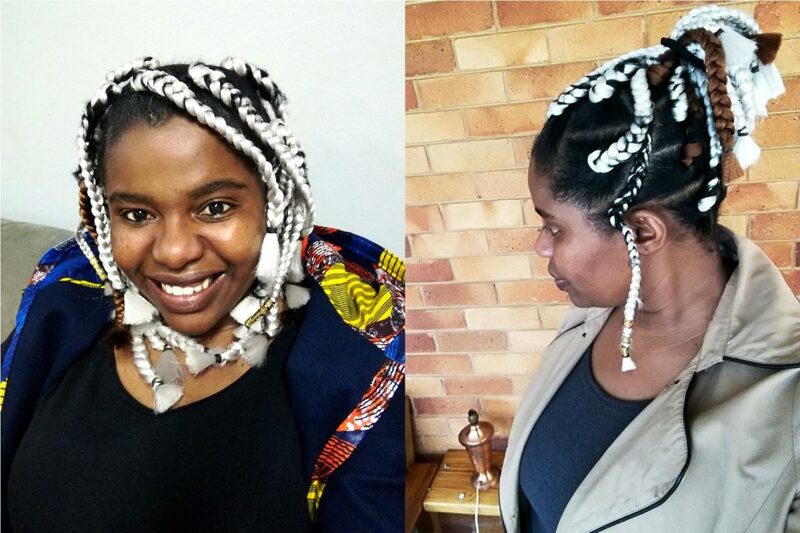 I was so pleased with myself that I had managed to create a hairstyle that is bold, creative and I was my own kind of beautiful. I turned a couple of heads as well as I went about my errands. I got a lot of compliments too besides those that said I was bold/brave. Not sure if that’s a compliment. Wearing that style got me thinking though. My hairstyle was a complete no no for a lot of people I know and met. While others fell in love with it. How people are so different and their likes and dislikes are so different though. How some people prefer to conform and fit in while others don’t mind being different and standing out. But more importantly, how we let others prescribe to us what beautiful is and not create our own beautiful. Because we are so different our beautiful is just as diverse. 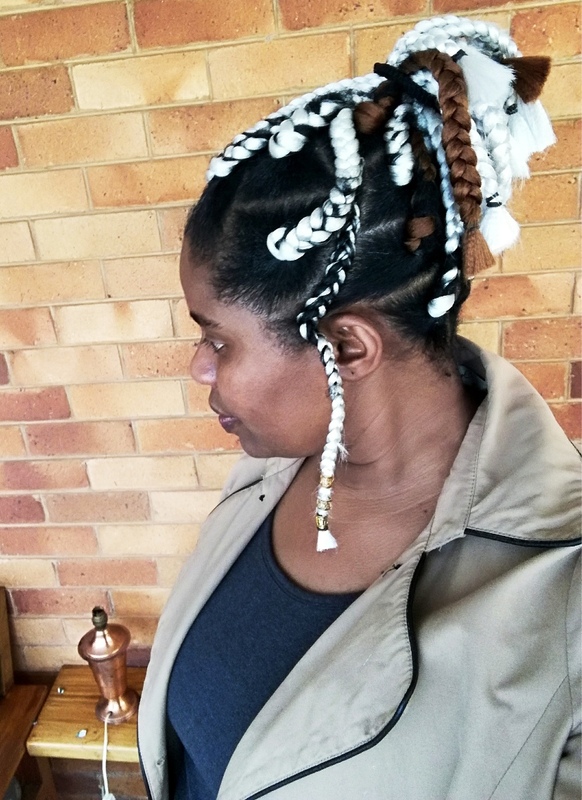 I had to take out my hairstyle just a week in because I was going to Zimbabwe, at my in-laws place. My work colleagues kept saying, people will think you are going mad, you have a mental problem or you are just one crazy person. While I may be all those, but then so what? In the end, I listened to reason and took the white braids out. 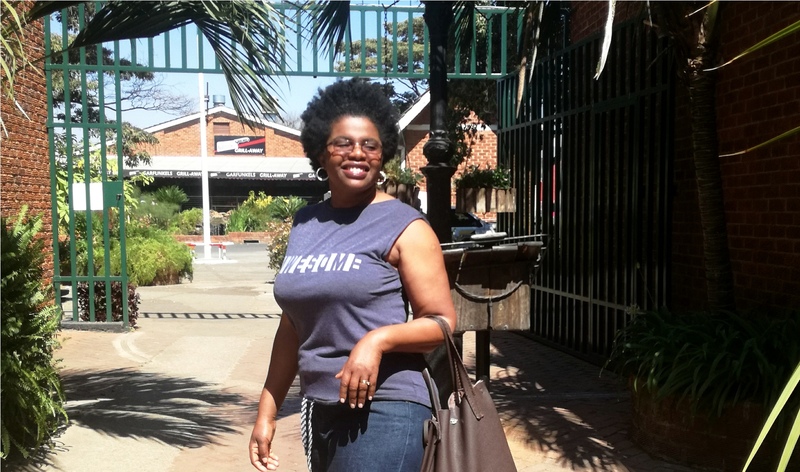 Went to Zimbabwe with my fro and since I seldom comb my hair, a few people looked at me with question marks on their foreheads as if they are asking “Are you crazy” And I would smile back politely while affirming that this is my beautiful. If you don’t agree, well, get a life. Being comfortable in my skin happened quite early for me and to some extent, I think it was imposed and I had to do it. I had no choice in other words. 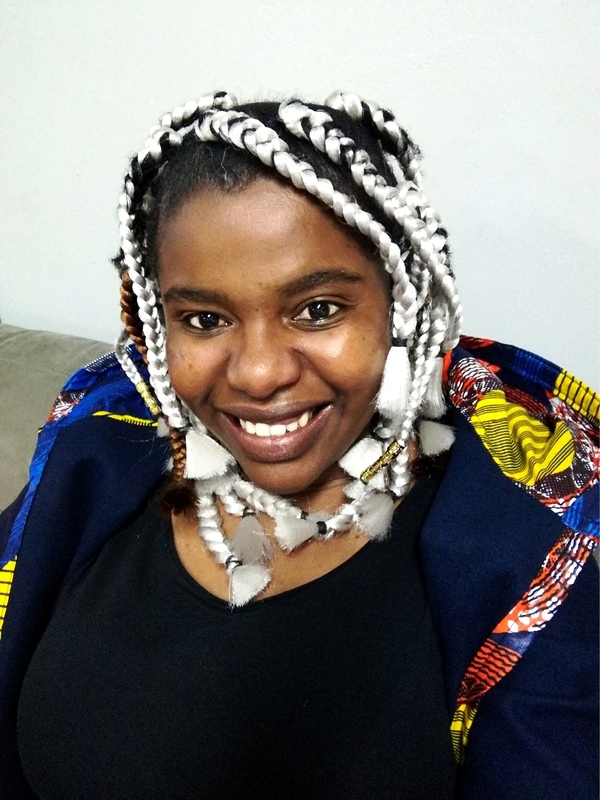 Having crooked teeth and not even a chance to get braces because the household budget didn’t accommodate such, a scar on my right cheek which I got when I was about 9 years old, my primary school life and part of high school was quite unpleasant. All the teasing and bullying was directed to me and I had to learn from early on that I was different and I could not fit in, even if I wanted to. So, I had to learn to be comfortable with my scar as a young woman and still afford to smile with my crooked teeth. I had to be comfortable and work with what I had instead of wishing and striving for what I did not have. I was and am still my own kind of beautiful. Although the scar is still there, when I look into the mirror, I don’t notice the scar anymore. I just see me. When I smile, my teeth are not a bother anymore. I have learnt to smile in such a way that much of the crookedness is concealed. Only when I laugh, and I do laugh very often, will you notice my crooked teeth. All the same, I am my own kind of beautiful and that’s me. So, if you are in that space where you just don’t fit in, don’t worry. You were not meant to fit in. You were meant to stand out like a light. That place is not yours and fitting in will never make you happy. Stand out and be the person that you are because you are not here for the sake of being here. You are here for a purpose and God put your emotions, feelings, built, mind and soul and all that makes you, you together so that you can go out there and fulfil that purpose you are here for. Don’t fit in if you don’t. You are a masterpiece and you are beautiful. 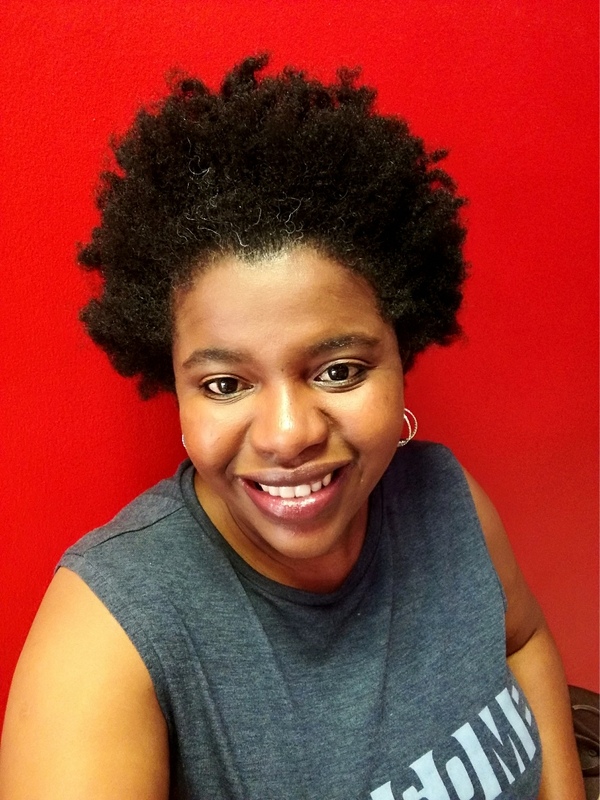 Evenes Ruth Mafupa is the founding blogger at Natural Sisters which is a natural hair blog. She started the blog back in 2012 to document her natural hair journey and also share her experiences on this amazing journey of self-discovery and embracing how her hair grows from her scalp. She is entrepreneur, Founding Director of Natural Moisture, mother to 3 boys and a DIY junkie.